I have no desire whatsoever to read Kerouac! So I guess I'm back to Toews. I too am back to voting for Toews. I would be in for a Middle Eastern Challenge - I have read so many books from that part of the world, but am always game to discover more! I loved the Persepolis movie (as much as? more than? the book). I'm sorry I missed last week's vote! I think Satrapi is brilliant. And the Persepolis movie is excellent too! 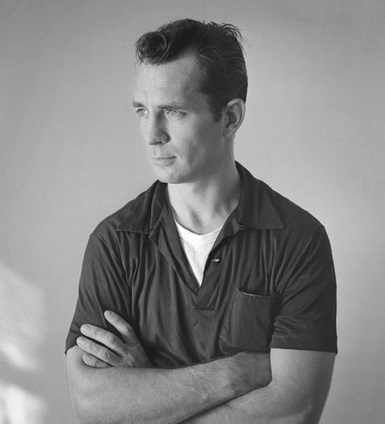 Nothing against Toews (I haven't read her), but this week my vote goes to Kerouac, for inspiring legions of hippies and infinite miles of roadtrips. "Whither goest thou, America, in thy shining car at night?" I have read a couple fantastic middle eastern books ...bring on the challenge! Just found your site and can't stop reading , have added a dozen books to my amazon wishlist in just an hour! Road novel versus road novel: The Flying Troutmans, while fun, will never compare to On The Road. No matter how much I've changed over the years, when I pick up On the Road I can still feel a little of that initial electric shock I felt as a teen when the world stretched out before me in a series of dusty highways and late night adventures. I guess I still cast my lot in with the mad ones. Kerouac, for sure. Dean Moriarty drives me nuts, but I gotta go with Kerouac. When I read On The Road, it makes me think of eating a really good cheeseburger at a roadside diner. And a side of fries. Ooh, this one looks like it will be close. I'd better vote for my woman. While I did enjoy On the Road (I read it just this year), I probably would have enjoyed it more when I was young and crazy...well, younger anyway. Despite having enjoyed it though, I have no desire to read anything more by Kerouac. Whereas, I've always looked forward to Toews's next thing.